You would think that with all the years the Model 1911 has been around, the market would be saturated by now. You would think that with all the years the Model 1911 has been around, the market would be saturated by now. Not so. In fact, manufacturers can't keep up with demand. Over the past few years, I've talked to the folks at Smith & Wesson, Sigarms, Rock River Arms, Kimber and a host of others about the never-ending popularity of the 1911. They all say sales are brisk, and to prove it they continue to belt out variations of the gun with a choice of slide configurations, barrel lengths and two-tone options. The author's best group was this impressive five-shot string that measured only 11⁄2 inches—offhand—at seven yards. Kimber, for instance, lists more than five dozen models from compact to full-size .45 automatics. While they are all basically the same in operation and appearance, it's the little things that count in a service or defense weapon. Kimber offers many color combinations in blue and stainless, options in sights and grips, and various chamberings including 9mm, .38 Super, .40 Smith & Wesson and the .45 ACP--covering just about every need imaginable. Digging deeper we find that certain models come standard with night sights. Magazine bumpers are available and in many cases come standard on tactical automatics. In addition to all this you will find specialized guns such as the Pro CDP II--with a longer Commander-length barrel for those who like the balance and minimal muzzle blast this type of gun offers. When I was involved in IPSC competitions, I favored the Colt Gold Cup in .45. I installed a stiffer spring, had the gun hard chromed and got a trigger job. At that time, it cost me a few bucks over the original price, but today, most knowledgeable gun manufacturers include the above work as options on the standard-model package. A view of the checkered slide release, safety lever and magazine release. Now, with IPSC behind me, and my current liking for extra fancy guns, I naturally gravitated to the new top-of-the-line Kimber Grand Raptor II pistol. If you thought all government inspired .45s are ugly, you had better take a closer look at this Grand Raptor II. Decked out with a blued steel slide--contrasted by the stainless steel frame--this gun scores high in the looks department. The Grand Raptor II is a special factory gun, so there is attention given to many of the areas that run in concert with gun handling. For instance, the rear grip frame is checkered, while the front of the frame is scalloped, providing a secure grip without the bite that sharp checkering can give. The wood grips have a unique scale pattern, surrounded by a border, nicely done on blanks of select rosewood. The slide features the same scalloped pattern on both the front and rear of the slide. While not exactly contributing to handling characteristics as much as aesthetics, the top of the slide has a single row of back-cut scales, which also cuts down glare. This gun has fully adjustable sights that are melted into the slide. All edges of the rear sight assembly are rounded off. The blade sits at an angle to keep reflections at bay and has a white line cut into the base of the notch. Both front and rear are Meprolight tritium night sights that make for an excellent sight picture in just about any conditions--day or night. The top of the slide is back cut and scalloped to reduce glare and also adds a nice styling touch. Straight from the Kimber Custom Shop, the trigger broke at four pounds even, with just a hint of slack before the sear released. High quality Meprolight target sights come standard. Note the small line of tritium under the notch. Operator controls are easily accessible and are for the most part set up for right-handed shooters, although the safety is ambidextrous. The slide release is checkered, and the magazine release is located directly below this release. 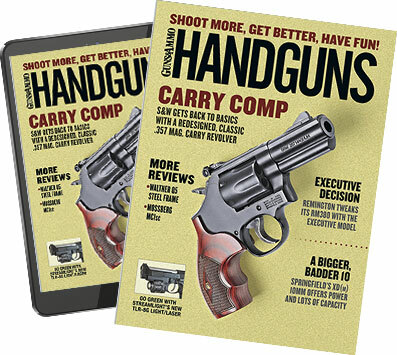 One note here is that I wish Kimber would make the mag release just a little larger, as it would speed up dropping the magazine--especially with gloves on. In any event, pushing in on the magazine release drops empty magazines with enthusiasm. Thanks to a beveled magazine well, a fresh magazine can be inserted easily, and an extended magazine bumper makes sure the magazine is fully seated. If desired, a full-size mag well can be special ordered from the Kimber Custom Shop (914-964-0742). The gun proved accurate and dependable; no malfunctions were reported with any of the ammo tested. supplied for takedown. Place this special wrench on the barrel bushing and, while pushing down, turn the bushing clockwise. Remove the bushing, being mindful of the recoil spring plug and spring-- they are both under tension. slide latch is in alignment with the disassembly notch, and push the slide stop in on the right side while pulling it out from the left. Remove the slide, recoil spring and barrel. Reassemble in reverse order. Notes: Velocity recorded 10 feet from the muzzle with a Shooting Crony Chronograph. Accuracy was the result of offhand shooting and all groups are the average of five shots, groups at seven yards. Abbreviations: JHP Jacketed hollowpoint, full metal jacket. At the range, the gun behaved like a true thoroughbred. Using various brands of ammunition, range testing moved right along without a hitch or malfunction of any kind. At the typical defensive distance of seven yards, shooting offhand, groups smaller than two inches could be counted on from a wide variety of ammunition and bullet weights. After spending some serious range time with the Grand Raptor II, I would recommend it to anyone. If it's your time to purchase a quality .45 automatic, look no further.